← What Are the Hottest Tech Neighborhoods in Chicago? 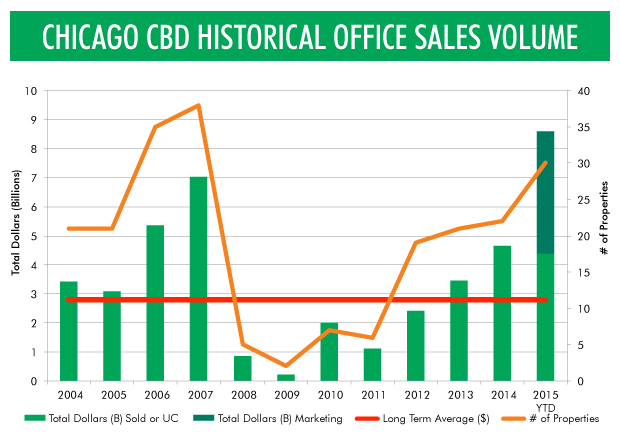 Office sales activity in the CBD is on pace to sail past the previous peak set in 2007. Thus far in 2015, 20 assets have traded totaling $4.4B, while another 20 assets representing $4.2B are being currently marketed or are under contract. The previous high-volume year was 2007, when 37 deals traded totaling $6.35B. At this year’s current pace, projections are that sales could potentially exceed $8B. Discount to Replacement Cost – Unlike Coastal markets, almost every trade in 2015 will transact well below the ever-increasing cost of construction. Yield Premium – With interest rates having remained so low for so long, investors are starved for yield and Chicago offers a significant premium to coastal markets and provides an opportunity to underwrite both current and total returns in excess of coastal markets. Additionally, these returns are achieved with rent growth projections that are much more conservative than other Tier 1 markets. Increasing Rents & Demand – Rapid growth in the tech sector as well as demand from relocating suburban firms has market occupancy rates nearing stabilized levels. As quality options continue to dwindle, investors anticipate rent growth in the near term in excess of 5 percent annually. In 2014, foreign capital represented $1.5B, or, 31% of total transaction volume. Of the $4.8B in trades so far in 2015, $570M has come from countries outside the U.S. According to Real Capital Analytics, Chicago was the fourth largest destination for foreign capital by dollar value during the first half of 2015, behind New York, Los Angeles and San Francisco. “Both foreign and domestic investors alike are looking for places to maximize risk-adjusted returns and are very attracted to the yield premium available in Chicago, versus the coastal gateway markets, ” said Deuter. To read CBRE’s latest Global Capital report, click here.